Today at DB Sports Tours we are delighted to bring you the news that DB Sports Tours contracted player Adam McDonnell is to make his senior debut for Ipswich Town tonight against Doncaster Rovers. Here at DB Sports Tours we don’t just provide team trips and sports tours, but also look to guide some of Ireland’s best youth footballers through their careers. Today is one of the days all the hard work pays off, with McDonnell set to make his senior debut later this evening. The Dublin-native began his career at Home Farm FC, before moving to Shelbourne FC where he made his move to Ipswich Town, where he hoped he would be guided toward the first team which is of course managed by Irish soccer legend Mick McCarthy. McDonnell’s rise to prominence took a serious step forward last season while playing in an under-21 game against West Ham. During the game he lined up against former Barcelona centre-mid Alex Song, and didn’t look out of place in the game. 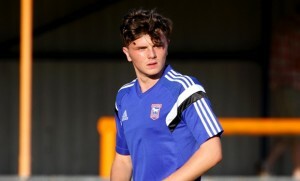 Later this year Adam took another step forward in his development; spending time with Ipswich’s senior side for their pre-season tour, where he featured against the Bundesliga club Fortuna Dusseldorf, and started against Irish side Shelbourne FC. McDonnell, who is an Irish under-19 international, is contracted to DB Sports Tours, with the company’s co-founder David Berber today reminiscing of McDonnell from the early days. “When I saw Adam play for Ireland against Dundalk under-19’s I saw him as a player who could control and dictate the tempo of a game. That day he absolutely bossed it from start to finish. “From there he progressed quickly through the ranks at Shelbourne; for under-17’s, to under-19’s, to the first team. He then of course went of trial to Manchester United and Bolton. Ipswich quickly signed him after seeing him play in a pre-season friendly. David really couldn’t be more effusive in his praise for only Adam as a player, but as a person too: “He is a great lad, and he really deserves his chance”. Everyone at DB Sports Tours would like to wish Adam the best of luck for the rest of the season with Ipswich Town.